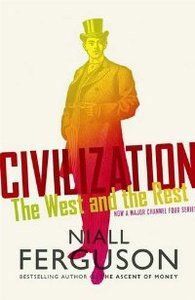 Review of Civilization: The West and the Rest, by Niall Ferguson (2011) London: Allen Lane. 402 pages. Perhaps a bit of uncertainty? Not sure how long a list to compile? Not sure of your priorities? Isn’t it a matter of taste? And importantly, most of us are not at all sure how WC came about. First of all, while not too sure where WC begins and ends, Ferguson certainly has a lot of positive things to say about it. By that he means not just “High Visual Culture”, art, architecture, and music, but all the cultural and technological achievements. His Wikipedia entry includes a poignant quote concerning how fragile and vulnerable WC is today, how much its virtues are taken for granted by Westerners, and how much WC is appreciated by those who have found blessed relief in WC after escaping their ancestral culture, a favored example being the Somali woman, Ayaan Hirsi Ali, with whom he now lives [ahem….]. His book begins with a list of what he is amused to call “killer apps”, the factors which he believes were responsible for WC’s existence, in the first place, and its major achievements including the takeover of much of the world. Even if you think he has left something out (see below), you’ll be given a good head start in making up your own list. Ferguson will be detested by some leftists or liberals for emphasizing the positive contributions that countries of the West made to “the Rest” in the course of colonial empire building. He does acknowledge unpleasant and sometimes horrifying acts which Westerners have perpetrated against other races. But he reviews with a remarkable and refreshing realism the long history of much worse homicide and warfare against fellow Westerners culminating in the two World Wars. The homicide rate in 13th-century England was 100 per 100,000, compared to, say, the 69 per 100,000 of today’s S. Africa or Columbia’s 53. The fact that he refuses to grovel in guilt means that the extreme PeeCees are still not likely to give him a pass. But because Ferguson is such a well-known member of the intellectual establishment he can get away with a lot. As far as he goes, he’s our ally. For the supposed empirical evidence for natural selection in England, he sites Gregory Clark’s A Farewell To Alms. (Clark does implicitly implicate genes but doesn’t mention them.) Instead, Ferguson claims that “institutions” are the key to it all. He can’t imagine that the above natural selection pressures could not have been at work in France and Italy which he implies were not as characterized by the “killer apps” as England. This would seem arguable, given the likes of Leonardo da Vinci, Galileo, or Pasteur. He, himself, speaks of “Western Civilization 1.0” as existing in the Fertile Crescent, Athens and Rome. The severe “competition” that he describes for Europe may well have been fomented by geographical circumstance, e.g., rivers and mountain ranges that divided up Europe and discouraged a European monoculture. But most of his other “institutions” (could we call them all “factors”?) must surely have been influenced by an increase in human brain power. Ferguson has surely begged the question of the origin of his “institutions” which seem unlikely to have arisen in the absence of natural selection (of genes) for human talent. However, one can perhaps forgive him for not venturing far into topics that have led to such eminent intellects as James Watson being quickly removed from conventional learned society. Ferguson’s non-reductionist emphasis on several “apps” will be widely appreciated. But the resulting complexity, paradoxes and confounds, to which much of social science would want to apply multivariate statistics and partial correlations, he tries to deal with using his nimble mind and considerable historical knowledge, mainly by comparing different cultures with regard to a particular “app”. Not easy, given the potential for interactions including gene-culture co-evolution (not mentioned). In Chapter 1, on competition, Europe is compared with China. Where Europe was a morass of small, decentralized and highly competitive fiefdoms, eventually coalescing into still numerous “nation states”, China during the Ming period (14th –17th centuries) was a vast, stable, unified empire, challenged only by Mongols and Japanese pirates now and then. As early as the 11th century, the Chinese had already invented many important technologies (e.g., printing presses and gunpowder that was used for military explosives). But after the 15th century all that inventiveness and creativity seems to have tapered off — thanks to a Confucian zeitgeist rewarding conformity and obedience and a government that exerted firm, stabilizing control everywhere, isolated from foreign commerce and influence. Europeans, with a more tractable written language, then leaped ahead of them in innovation and capitalist economies. With Chapter 2, on science, we have another cultural comparison, this time between the West and the Muslim (7th century onward) world. Early and medieval Muslims had made great progress in developing mathematics (from Greek and Indian origins), science, medicine and cartography, but by the 11th century Muslim clerics and Sultans were snuffing out science as blasphemous (what took them so long?) At the same time, European governments were actively supporting science — in spite of Christian clerical objections. Ferguson describes the decline of the Ottoman empire and the reversal of Turkey’s decline by Atatürk, who adopted many of the features of WC including a more sensible alphabet. Ah! So a decline can be turned around? An inspiration! Ferguson also has a high, perhaps “neo-connish”, regard for Israel, relative to Muslim countries, as a highly successful (e.g., number of patents registered) outpost of WC. He notes Iran’s accelerating support for science but also its continuing lack of a “key part of the West’s winning formula”: property rights, rule of law and truly representative government. What about Israel’s lack of respect for Palestinian property rights? No mention of that here, although if those rights had been respected Israelis would undoubtedly be getting along better with their neighbors. A comparison of a successful North America and a relatively unsuccessful South America is the theme of Chapter 3, on property. After dismissing many climatic, geographical and resource differences, Ferguson concludes that the crucial difference lies in the North’s democracy that is founded on “the rule of law….the sanctity of individual freedom and the security of private property rights, ensured by representative, constitutional government.” [p. 97] Just having elections is not enough. South America’s problem began with the Spanish government owning all the land, after which a criollo elite obtained the use of large tracts of land along with ownership of the indigenous population’s labor (previously owned by the Inca elite). So most people, whether Iberian immigrants or indigenous Indians, didn’t get to have more than “tiny plots of land”. Lack of experience with democracy or administrative responsibility are cited as factors, as well. Oddly, Ferguson makes no mention of Hernando de Soto (Polar), the well known Peruvian economist whose Institute for Liberty and Democracy (ILD) has done so much to promote property rights (especially for the poor) both in Peru and elsewhere in the world. In contrast, British immigrants to North America could all become substantial landowners entitling them to vote for representatives to a legislature — even though ¾ were initially indentured servants. Since these mostly Protestants tended also to be imbued with a good work ethic, another “killer app”, they worked hard to improve their material conditions. Simon Bolivar, the liberator and ruler of much of early 19th-century South America, gave up on establishing a political system like North America’s, given the chronic warfare which he attributed, in part, to racial diversity. But Ferguson argues that “multi-coloured Brazil” is leading South America to an economic prosperity which he anticipates will be on a par with North America (i.e., he’s not certain), and he asks without answering, “Why not in Africa, too?” Neither the stability of a multi-racial society nor the inherent traits (IQ or personality) of African ethnies are questioned. It would seem that Ferguson is trying to have his cake and eat it too. He glibly provides reasons for attributing WC to institutions rather than to any inherent traits of the people who created it. Certainly some “apps” have been quickly adopted around the world, e.g., consumption/consumerism. Yet he ignores the question of why those institutions were created by those particular people. And are they all readily adaptable to other cultures? E.g., the rule of law? His Chapter 4, on medicine, reports on the phenomenal scientific achievements of Europeans — whose relatively high IQ is surely genetically influenced. In fact, he later concedes that Jewish dominance of Western intellectual life suggests a “genetic as much as a cultural advantage” (p. 235). Jews yes, but gentiles no? Why? He also derides the “pseudo-science of eugenics”. But the success against Tay Sachs syndrome among Ashkenazi Jews was eugenic, as is genetic counseling generally. What is “pseudo” about all that? And how can Ashkenazi Jews have a high average intelligence in the absence of eugenic practices? Chapter 5, titled “Consumption”, is a wide-ranging paean to consumerism as a powerful force for the spread of WC beginning with textiles and clothing fashions. There is Ricardo’s Law on the division of labor, the Austrian economist Friedrich von Hayek’s prophetic enthusiasm for the market over state planning, and a description of the competition between the remarkably similar programs of Stalin and Hitler who are eventually displaced by the capitalism of today. Wisely, he later points to “over-consumption” as a factor in the financial crises we’ve been experiencing (thanks to debt) and to the likely environmental catastrophes that we face as more of the world embraces our consumerism and resource depletion. For now, he suggests that we are threatened by “our own lack of understanding of, and faith in, our own cultural heritage.” Amen to that. The (Chap. 6) work ethic “app” relates, of course, to Weber’s Protestant ethic, except that things are more complicated, e.g., by the thoroughly successful Jewish work ethic, and the likelihood that the Protestant part came after an already highly developed work ethic on the part of Northern Europeans. Oh? But no genes mentioned here either. The book ends, heuristically, by addressing the theme of Armageddon and the possible decline of WC — an unsurprising parallel being drawn with Rome’s decline following Hun and Goth terrorism and immigration. Given his numerous “apps” and their corollaries, Ferguson goes to some length in emphasizing the complexity of a civilization such as ours, which makes predicting its future dicey. But the end could come fast! “The Roman empire…did not decline and fall sedately. It collapsed within a generation. … Comparably swift collapses have been a leitmotiv of this book” (p.302). “If ever an empire fell off a cliff … it was the one founded by Lenin”(p. 303). But there is good news. He does not foresee a serious “clash of civilizations” à la Huntington. Nor does he foresee a collapse of the institutional “killer apps” of WC since so much of the world is adopting them. A quick reading might suggest that he could care less about the people who created those “apps”. However, one can read between the lines, especially on the last page: “Maybe the real threat is posed not by the rise of China, Islam or CO2 emissions, but by our own loss of faith in the civilization we inherited from our ancestors” [p. 325, emphasis added]. He derides our historical ignorance including the fading familiarity with the “foundational texts of Western civilization” (his own short list includes Darwin’s Origin of Species and, in first place, Shakespeare’s complete works). Fine. Ferguson has certainly rather deftly avoided electrocuting himself on the third rails of political correctness, although there are several items for which lesser authors would be called “white supremacists”. He has written a very entertaining and informative book that does not fall into the currently fashionable nonsense of attributing the success of the West to the profits of colonialism and slavery. Major drawbacks are the lack of attention to the ethnic basis of Western Civilization and to the role of Jewish intellectual predominance (which he acknowledges) in rationalizing the massive invasion of Third World peoples who now pose its greatest imminent threat. Indeed, his lack of attention to the ethnic basis of Western Civilization shows the extent to which he has internalized the current intellectual zeitgeist and its poisonous implications for the culture he finds so compelling. Nevertheless, it could be usefully promoted by activist groups, such as Youth for Western Civilization, The Political Cesspool, Stormfront, or American Renaissance, who are trying to defend Western Civilization against the worst excesses of the current onslaught by the multicultural left and to celebrate the people who created it.